Yuta Sugiura, Calista Lee, Masayasu Ogata, Anusha Withana, Yasutoshi Makino, Daisuke Sakamoto, Masahiko Inami, Takeo Igarashi. 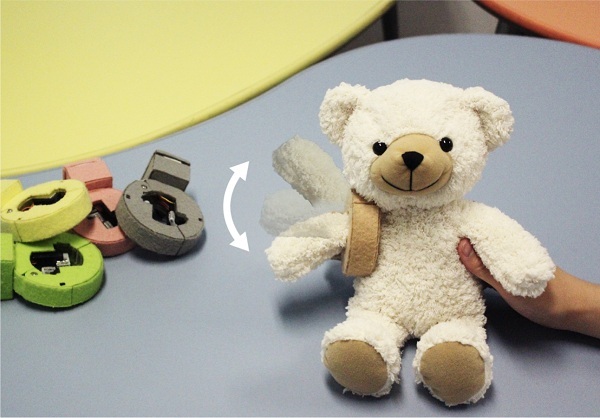 "PINOKY: a ring that animates your plush toys". The 30th international conference on Human factors in computing systems (CHI 2012), pp.725-734, Austin, Texas, May 5-10. 8th ACM/IEEE International Confrence on Human-Robot Interaction (HRI 2013), Tokyo, 3/3-6, 2013. ACM SIGGRAPH ASIA 2011 Emerging Technologies, Article No.14, Hong Kong, December 2011.